When the all-new BMW 750iL was released in 1988 (a short while after the 735i), it set the motoring world abuzz as the very best luxury saloon on earth. Retailing for $10,000 more than its nearest German rival - the top-line Mercedes 560SEL - the BMW incorporated a level of electronic sophistication never seen before in a motorcar. Features such as electronic throttle control, ABS and a CD player were still several years down the track in conventional production cars. 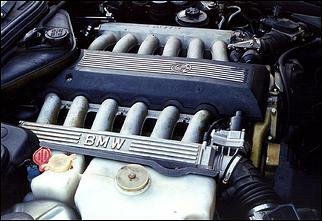 The 750iL's powerplant - a marvellous 5-litre V12 - was also in a class above its Mercedes and Jaguar rivals. 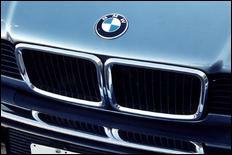 Clearly, the big new BMW debuted as the very best full-size car of its time. 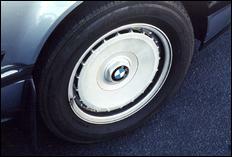 Interestingly, the big BMW's brakes are relatively small by today's new car standards. Despite tipping the scales at 1920kg, this vehicle comes braked by a combination of 308 and 300mm discs front and rear. It does, however, come with ABS to help maintain driver control under maximum retardation. Rotate the car's power-assisted recirculating ball steering to full lock, and the 750iL will trace a 12-metre circle - which is quite tight for a car of this size. Style and grace were the two words most commonly used to describe the 750's appearance. From its classy shining grille emblem to its elongated lines, it can be immediately distinguished as a luxury saloon. 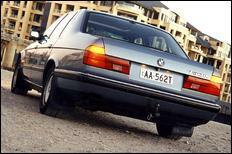 However, the only cosmetic features of the 750 over a 735i (other than its length) are its wider grille, slightly flatter bonnet, rear badge, revised alloys and twin square exhaust tips. As you'd expect, the body is built with consistent panel margins, quality paint finish and there is nothing that has proven susceptible to failure or deteriorating. 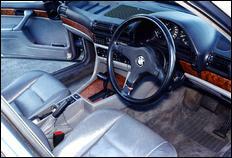 Being a top-line luxury limousine, the interior of the 750iL must have been luxury indeed when it was released in 1988. 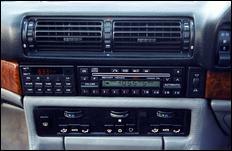 Its list of standard features includes stitched leather coverings, polished wood grain trim, tilt and slide metal sunroof, 10 speaker Becker CD/tuner, full-function LED readout of all operating systems and a combined trip computer/clock/date/ambient temperature display. 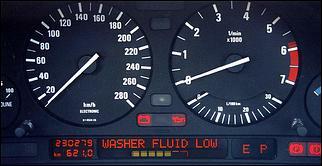 The dashboard is similar to other contemporary 7-series, incorporating clear and easy to read instrumentation. And now we come to listing just some of the 750iL's electrics... To begin with, the driver's seat is electronically adjusted and incorporates three user-definable memory settings. The external body mirrors automatically adjust to their preset position whenever one of these seat memory recall buttons are pushed, and - furthermore - the left hand exterior mirror will automatically dip whenever reverse gear is engaged (this helps ensure that you don't grind those alloy wheels along an unseen concrete gutter). Note that the rear seat is also electrically reclining - making it perfect to stretch out in over long distances. The headrests across the back seat even automatically elevate when the rear seatbelts are fastened... As mentioned, there is a full function LED display housed inside the dash binnacle. This gives warning (in English) of everything from low oil pressure to a low washer bottle level - and displays each in the appropriate order of importance. BMW pulled out all stops when it came to developing the 5-litre V12 engine for the 750iL. This is one of BMW's first all-alloy engines, and - amazingly - it is said to weigh less than its iron-blocked 3.5 litre 6 cylinder cousin. Note, however, this motor is essentially designed as a pair of 325i six cylinder engines siamesed together at a 60-degree angle. Surprisingly, its compression ratio is only 8.8:1 - which means it's quite happy to put up with everyday ULP. The top-ends uses a chain-driven SOHC with single 42mm inlet and 34mm exhaust valves per cylinder. The big V12 utilised what was then a cutting-edge engine management system - Bosch Motronic. 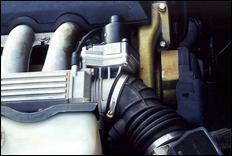 Notice that there are two Motronic ECUs - one dedicated to run each bank of six cylinders. This arrangement sees twin mass airflow meters, direct fire ignition plus the first pair of fly-by-wire throttles ever fitted to a mass production vehicle. Even today it's something to enthuse over. Behind every 750iL engine resides an electronically controlled 4-speed automatic transmission (which is essentially a strengthened version of the 735i's). Three driving modes are available - economy, sport and manual. The manual mode allows easy shifting when you feel the need to take full control of the driven ratios - but of course, being of 1988 heritage, there is no up/down sequential style selector lever. The rear end, meanwhile, spins a tall-geared 3.15:1 LSD. Despite its hefty 1920kg kerb weight, the 750iL is a genuinely effortless performer. Cruising at a constant 2500 rpm at 100 km/h, a mere squeeze of the throttle gives a silken rise in torque that surges the vehicle forward. There is no push in the back - just a strong progression of speed. Revs - unless you are absolutely burying your right foot - never really need to rise over about 4000 rpm. But this doesn't mean that this 5-litre twelve is an out-of-breath truck engine. Far from it. With peak power arriving at 5200, you can readily take it to 6000 (the programmed rev limit) and not feel any real drop-off in torque. Certainly, from idle to redline, the BMW V12 is a beautifully linear powerhouse that's a tough act to follow - even today. Of course, anyone that could have afforded to buy a brand-new 750iL in 1988 wouldn't have been too concerned about its fuel consumption - and that was probably just as well. Our test car consumed an average of around 18-20 litres per 100km... Lucky it carries a 102-litre fuel tank! On the road, the 750iL is a very interesting motor car. Indeed, it must have been stupendous back in 1988 - but how does it stack up today? In terms of noise and ride quality, it has to be said that something like a current model Mitsubishi Magna is noticeably superior. That's not a slur on the 750 - the fact that it's only just bettered by a car more than 10 years its junior earns it praise. When it comes to handling, contemporary road tests commonly told of how the BMW was unequalled in its class. In our test car, we found its turn-in eager and precise, and its cornering stability exemplary. Understeer would only appear when you're being ham-fisted with the steering, and oversteer was evident only at a very high limit. Our test 750iL's steering, however, did have a large zone of free-play at the straight-ahead position. This indirectness in a straight-line cruise often made the iL feel like more of a tank than it really was. Certainly, BMW did a good job of tuning their "double six cylinder" but - as usual - a little extra performance can be found by freeing up its luxury market intake and exhaust systems. A large diameter gas pipe with hi-flow cats and mufflers would give the BM perhaps another 5-10% power - together with a more vocal outlet for the V12's gorgeous exhaust note. Our quick inspection of the factory air intake also revealed good diameter pipes (plus there's one leading into each separate airbox), so there might not be a lot to gain in this area. Maybe 5% power - maximum. 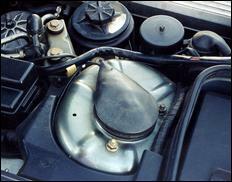 Once these basic breathing mods have been performed, it's up to you what comes next. Tuning parts are available in Germany, but often it's more practical (and cheaper) to execute some custom mods locally. The compression ratio could easily be raised by more than half a ratio (so long as you run PULP at all times) and a more modern programmable management system could be used to maximise power. Problems may be encountered with running the fly-by-wires and other operating systems, however. Heading even more extreme, we've recently seen a BMW V12 stacked with nitrous and another one with a twin-turbo conversion! Power figures are unavailable, but we'd guess that a twin-turbo'd BMW V12 (with a full engine build) could easily generate anywhere up to 400kW. Those people that are extra adventurous may also look into the possibility of fitting the DOHC, 24-valve heads as were fitted to the M1 limited-production racecar (very rare and very, very expensive!). 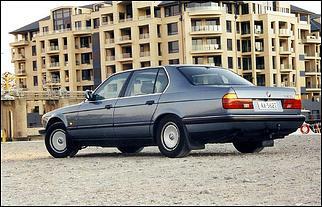 As mentioned, the 750iL's factory alloys look awful. Aftermarket wheels are indeed a necessity to gain some more richly deserved street credibility - but note that anything less than around 17 inches diameter will go unnoticed thanks to the dimensions of the body. 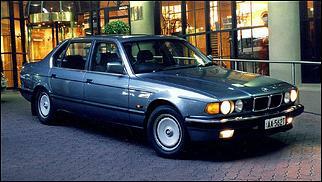 A tremendous $216,000 price tag was attached to the 750iL back in 1988. Today, however, you can scoop one of these cars-for-royalty for a pale 30-odd thousand dollars. Some examples can be bought even cheaper - such as our 230,000km test car, which the owner claimed was only worth around $20,000! That represents truly amazing value. We'd assume that just the V12 engine alone would be worth that much! Kilometres are something that are very important to look at when evaluating a 750. We can't stress enough the horrific running expenses of such a magnificent (and, of course, aging) vehicle. Some typical wear-and-tear type repairs include new shockers ($1700 each for the rear, and $1000 each at the front!) and a new set of plug leads (around $1000 per bank). The stepper motors on the heater system may break off - and this is around $2500 to fix. The odd leak here and there may be expensive to repair, as a complete set of manifold and rocker cover gaskets may run to a couple of grand to remedy the problems. Of course, the 750iL will be a heavy car on brakes, so expect to need new discs and rotors about every 20,000 kilometres. These, however, are quite reasonably priced at $150 each per disc (plus pads). Notice that these prices are all genuine BMW, as there are very few aftermarket parts available to suit. 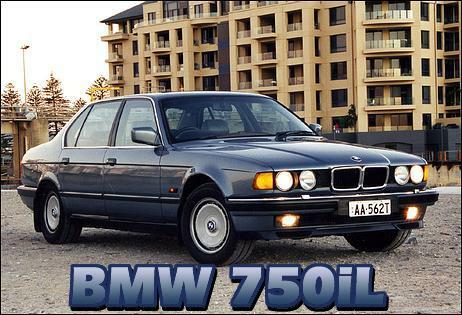 The BMW 750iL represents one of the few opportunities where an average person can afford to purchase what was - and still is - a truly awesome motor car. While its ride quality, noise suppression and many of its electronic features can now be enjoyed in a wide variety of cars, it does however, boast an engine that will always be difficult to match. The car's prestige and on-road presence is also unrivalled at its extremely low price. Certainly, the biggest negative aspect of purchasing a 13-year-old 750iL is its running costs. Remember, this vehicle drinks nearly 20 litres of fuel per 100km and requires a huge cash reserve whenever something does need repairs. But then - as ever - this car is a true indulgence. Thanks to Michael McMichael Motors (specialists in BMW servicing) for making our test car available. Ph: 08 8362 4788.